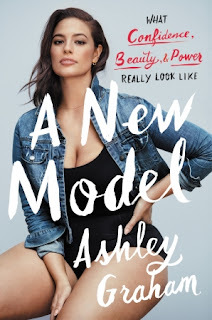 Model and Body Activist Ashley Graham revealed today that her upcoming book A New Model What Confidence, Beauty, and Power Really Look Like will be released on May 9th. It is published by Harper Collins. According to their website, it will be a collection of insightful, provocative essays illustrated with a dozen photos, Ashley shares her perspective on how ideas around body image are evolving—and how we still have work to do; the fun—and stress—of a career in the fashion world; her life before modeling; and her path to accepting her size without limiting her dreams—defying rigid industry standards and naysayers who told her it couldn’t be done. As she talks about her successes and setbacks, Ashley offers support for every woman coming to terms with who she is, bolster her self-confidence, and motivates her to be her strongest, healthiest, and most beautiful self. It is currently available for pre-order for $26.99(list price). You can purchase your copy at Harper Collins, Amazon, and where ever books are sold. Will you be buying a copy? Let us know your thoughts in the comments below. I can't wait to read it!! I love Ashley!